A real working back up knives along with the mother blade to tackle any predicted, unexpected and sudden task or/and situations one may come upon.. The two accompanying knives of a kukri, Karda (Small Utility Knife) and Chakmak (Sharpener) can play an important role as a backup kit when carrying all necessary stuffs individually is not possible. One of the knives, KARDA, has a sharp edge forged for cutting and skinning activities and the other, CHAKMAK, has blunt edges on both sides meant for sharpening in case a proper sharpener is missing (not available). Here, with the REAL K+C, as per its name, the steel used in both accompanying knives are the same as its mother blade (khukuri) which is 5160 (high carbon steel) unlike its counterparts. 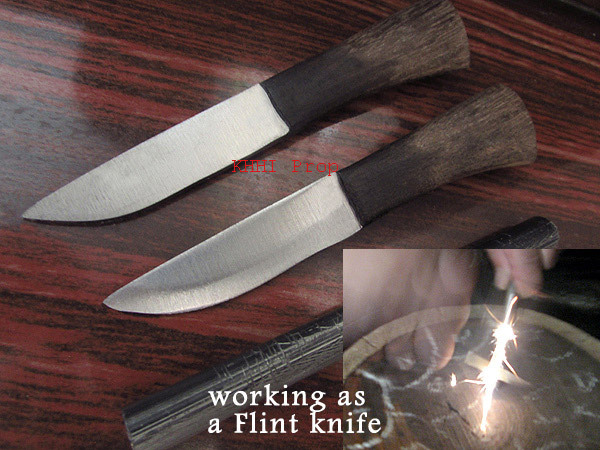 That means both knives are well heat treated and thus very strong, durable and can be actually used. Both are OIL QUENCHED in order to make it even more rigid and tougher (you can actually make a spark from a flint rod/stone). The hidden tang (stick tang) goes almost through the wooden/horn handle and is strongly secured by imported epoxy (the same used for mother blade’s handle). Their housing at the back of the throat of the scabbard keeps the two small knives firmly intact to the scabbard. Most traditional kukri knives would not be complete without these two knives. REAL K+C is the result of many customers (on demand) of KHHI who wanted a real working back up knives along with the mother blade to tackle any predicted, unexpected and sudden task or/and situations one may come upon. Almost all kukris come with these two small knives on the back section (throat) of the scabbard. The “Karda” (one edge sharpened) is a small utility knife used to perform tasks that the big kukri blade cannot. The “Chakmak” (Both edge dull/unsharpened) is the sharpener used to sharpen both the main blade, and the small knife Karda. To sharpen the kukri, place the blade firmly against a smooth leveled surface with the edge facing sideward by resting body weight on it as shown in the picture. Applying a little force, drag the Chakmak from the tip of the kukri to the notch (notch works as a stopper and prevents the Chakmak from going further up towards the handle) several times on one side. Make sure you maintain a certain rhythm and always start from tip to notch. Now flip the kukri to the other side and repeat the action. Repeat till you get the desired sharpness or edge. 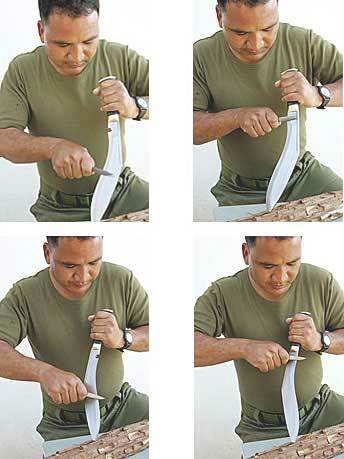 The Chakmak sharpening process is quite laborious and time consuming. Therefore, a sharpening stone or designated sharpening hardware is recommended for faster and better results.